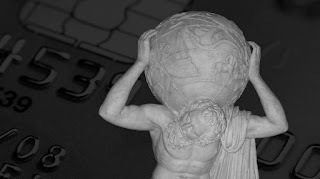 What does the Greek god Atlas carry on his shoulders? It’s a common misconception about a Greek myth. Zeus condemned Atlas to hold up the sky for eternity. Classical art represents the sky as the celestial spheres which look a lot like a globe. The confusion is understandable. Fortunately, it’s harmless. What happens when credit card holders carry a balance from month to month? It improves their credit scores, right? It’s a common misconception — a persistent financial myth. Why? Sadly, parents often unwittingly perpetuate the fallacy and misinform their kids. Unfortunately, it’s far from harmless. Don’t be one of those parents. Teach your kids that paying the minimum amount due on a credit card and carrying a balance month to month does not improve their credit score. It simply means they’ll be paying more money at extremely high interest rates. The bottom line: pay credit card balances in full every month. Period. Financial myth debunked. Greek tragedy averted.